Come to a place haunted by legends … where the search for treasure just might lead to murder. Come to the hills of the Ozarks and meet Maggie Porter and her dogs—a champion Labrador Retriever, an aging Cocker Spaniel, and a Beagle retired from federal service. Maggie’s returned home to reopen the family dog kennel business, where she’s plagued by problems from the start. Serious trouble arises when a gossip-loving employee turns up dead holding an heirloom locket belonging to Maggie’s mother. Anonymous threats and break-ins occurs as the violence escalates, and Maggie becomes a target when she searches for answers. With her loyal dogs at her side, she must dig for the truth. Along the way, she learns that everyone has something to hide—and some secrets are worth killing for. A cozy mystery with an edge, Deadly Ties is a tale of family, friendship, and betrayal in a mountain community where ties run deep and grudges can linger for a lifetime. 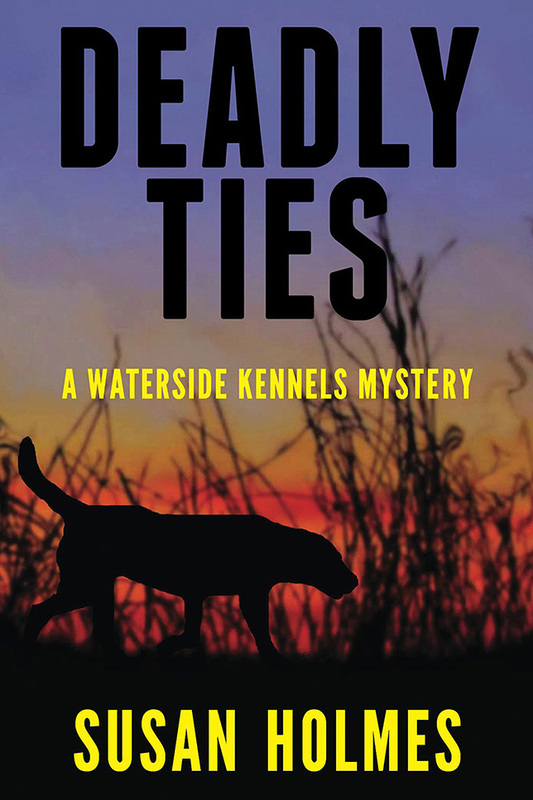 Deadly Ties now available in trade paperback at Amazon, B&N, & Independent Booksellers! Read the first 5 chapters FREE! I’m so glad Laurien Benson introduced me to you. I have a question for you. Did you ever read any of the late-nuts, can’t think of her name-but it was her bloodhound series? She wrote ten before her untimely demise…mystery series, not cozies, but exceptionally good. Bloodhounds used in SAR and backstory involving abused women. Her name will come to me, sooner or later. Kathleen, I’m very glad, too! Are you thinking of Virginia Lanier? Her protagonist is Jo Beth Siddon, who raises and trains bloodhounds. Strong mystery writer.